One of the great things about our Algarve walking group is the knowledge we can share. Walking one day in Spring I was talking to a lovely lady called Stephanie. She mentioned a favourite walk which included an abandoned, ruined village, and later sent me an email with a map. So it was that, heading west for a wine tasting, we decided to seek out the village. Just one problem- I didn’t have the map with me. But I did have some scribbled instructions, which I thought should do. The start was in pretty as a picture Alte, which we know well. 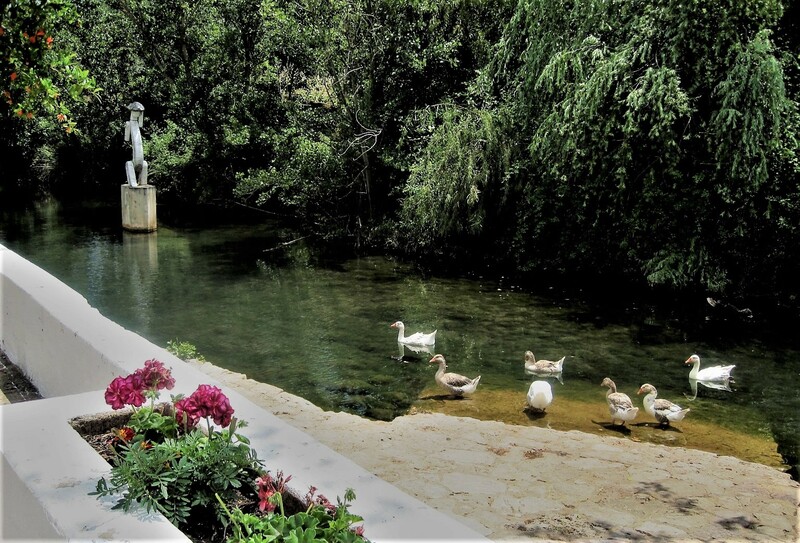 I always want to linger by Fonte Pequena, the smaller of the two natural springs, but my notes said to cross over the bridge and follow the signs for Julia. Not paying attention, as usual, I turned left instead of right. When the track became perilous and tangled with scratchy shrubs, I realised my mistake. Back down and turn right. Boa Vista beckoned, from the top of a seriously steep hill. Lovely views, and a stunning passion flower. The road was empty, but shade was non-existent. A cowardly decision was about to be made. Or should I say, good sense prevailed? The signpost indicated 4km down a dirt track to Esteval dos Mouros, the ruined village. Neither of us fancied getting hotter and stickier, and we still had the wine tasting venue to find. The ruins would have to keep for a cooler day. Back into Alte, hugging the sidewalk for shade. The spring gurgled down the hill, vivid lemon cactus flowers blinking in the sunlight. A relief to enter the cheerful pastelaria. There’s just time for a morsel of cake. Back on the road, Quinta do Francês proved tricky to find and we arrived with minutes to spare. A very pleasurable time was spent wine tasting, but I was reluctant to bring an end to such a lovely day. 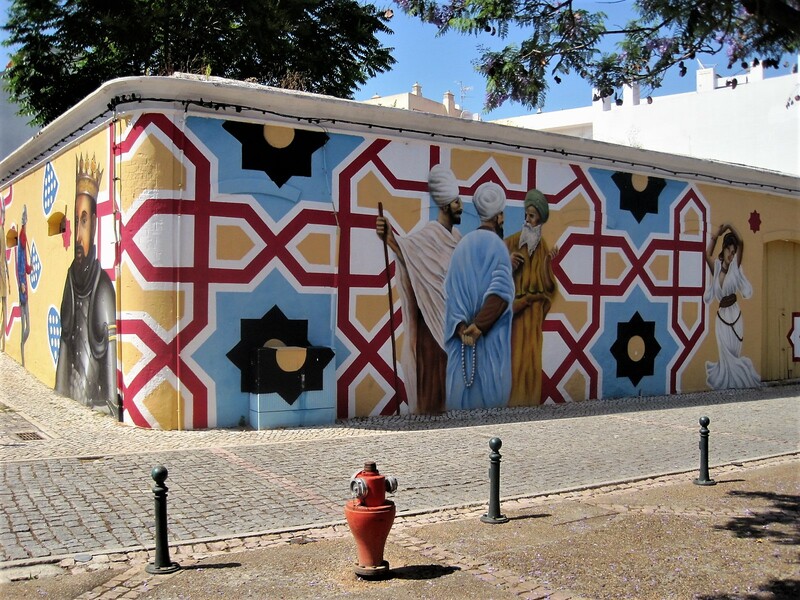 Our route home took us through Silves, where a striking mural caught my eye. A quiet stroll by the river and beneath the jacarandas brought the day to a perfect close. Linking this to Sami’s Monday Murals, where a bunch of like-minded people love to share. I hope she won’t mind. I had hoped to see Stephanie when the Algarve walkers met at Bolton Abbey in Yorkshire this week, as she lives nearby. If she’s reading this I can assure her that we’ll be back to complete her walk this Autumn. In the meantime I shall be sharing some English walks. Next weekend is our wedding anniversary and I’m dragging him off up the Northumberland coast. I hope to schedule a walk for next Monday, but my response rate may not be great as I’ll be in transit. How fascinating is this, our starter from Rupali? If I was looking for a piece of real estate, and I had lots of money in my pocket… I’d join Alice! The things Janet gets up to in Wyoming! And as for Jackie, what’s on the menu this week? Sounds good! Or you can enjoy a glorious splash of colour with Drake! Koalas and kangaroos! This is a very cuddlesome post from Carol, though maybe not the echidna! ‘Far from the madding crowd’ with Cathy, in the most beautiful scenery! I’ve watched TV coverage from the Algarve these past couple of days, and am horrified at the fires engulfing swathes of the countryside that I love. What sad times for so many! I think that walk earned you several glasses of wine and double helpings of cake. Really hope the recent and ongoing fires are not affecting this gorgeous village.